Pope Francis is a Marxist, and all Christians should be too. Just a couple of days ago in Canada, Federal Industry Minister James Moore made this statement. And of course, once the public and social media outrage (primarily on twitter) got to be too loud, Moore apologized (for being so foolish as to let his repugnant values show in public). Also, recently the conservative right in the US (Rush Limbaugh, in particular) have called pope Francis a Marxist for advocating for the poor and speaking out against capitalism. Pope Francis responded by saying he is not a Marxist and Marxist ideology is wrong, instead he is a Christian. These two media storms highlight a bigger issue that we are facing and that is economic inequality. And I think Christians could benefit from a little Marxism. Movements like Occupy Wall Street or the recent fast food workers strike show that the economic inequality created by capitalist policies is not really helping most people get ahead, but instead the majority (the middle class) is falling further and further behind the rich few. Even here in Canada, I hear intelligent, well-meaning people tell me that capitalism is the best economic system for us. I am only 31 years old, but even I remember a time when the ‘capitalists fat cats’ were more joke than revered social leaders. So here is the thing about Capitalism – The majority of us are not capitalists in this economic system. Capitalists have the capital (money) to invest in stock markets, to own means of production, to run the economy. We are workers, the proletariat, the ones off whom the capitalists earn their riches. Capitalism necessitates that the investors and owners take in the profit margins from the production of their workers. In other words, we must be paid less than we make, produce or earn for our employers. That is who capital is made. That is how capitalist invest in and own things. This is system is unequal from the get go, and most of have drunk the cool-aid thinking that capitalism is fair and balanced system. Our blind support for capitalism is something that capitalists have convinced us is good for us… Christians included. Karl Marx, on the other hand, said that the Capitalist promise, that what is good for the Capitalist (increased profits, lower taxes etc…) is also good for the average worker, is a big lie. Sounds like the lie of trickle down economics. The one that Pope Francis is naming. Pope Francis, you are a Marxist. 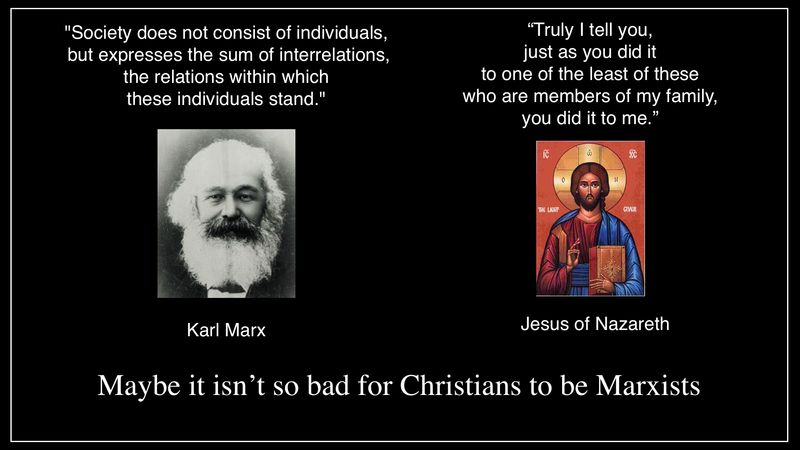 Christians should be Marxists too. We have all been told that Marxism is unequivocally bad. And the examples of Marxism or communism that our world has put into practice haven’t been any better than capitalism for making people’s lives better. They have been pretty awful actually. And I am not saying that we should switch to communism. But unlike Capitalism, which is a system that is designed to be concerned with and favour those on the top, Marxist thought turns towards the poor and marginalized. Marx’s concern for society or community, was above his concern for the individual. That concern for the poor sounds a lot like that Jesus guy. Marxism suggests an alternative to capitalism: socialism, perhaps leading to communism. But this where Marxism and Jesus diverge. Jesus points out that there is no system that will work perfectly. Jesus didn’t say you will have the poor until you institute a capitalist, mixed-market, socialist, or communist economic system. He said always. And this is where Pope Francis is calling us to turn our concern. Christians should not be about one system or another, we shouldn’t be advocating one political or economic system over others. But like Marx, our concern should be for the least of these, for the poor, the disadvantaged, the marginalized and the weak of the world. Those who are on the bottom and those who are losing ground. Not only is it our government’s job to feed our neighbour’s children, it is our duty and moral obligation. And as Christians whose attention is turned to the poor, who like Jesus, like Pope Francis, even like Karl Marx, we who strive for a better world need to balance our concern and work with a confession. We aren’t going to solve the problem. Our systems, our economies, our politics will not find the solution to starving children. Marxists, nor Capitalists, will find the solution. Human beings will not and cannot find the solution. Every system we create results in someone ending up at the bottom, ending up in the margins. And that is why as people of faith we turn the One who redeems our failures, who welcomed children when the disciples would not, who promises a new creation, a new system – not of our making, but of God’s. And in Pope Francis, in food for our neighbour’s children, in small acts of kindness and mercy that go unnoticed each day, we see a glimpse of that New Creation breaking in here all around us – and still yet to come. This one made me grumble and disagree a lot and revealed to me how decidedly UN Marxist I have become in the last few years. But it does remind me that the systems are not the solutions and that in a lot of ways the solutions are not even neccesarily attainable. But it the acts of the persons that bring that glympse of the New Creation and that I appreciated deeply. Thanks for reading! Politics is a lot easier than following Jesus… at least that is my experience. kinda of maybe at one point but im far too selfish nowadays, i see being selfish as a necessity more than anything. i mean obviously im selfish im human after all its part of my nature even the apparently selfless acts that we do are at there core selfish whether or not we consciously know or acknowledge it. but yh when i was younger i definitely was more a marxist and cared a lot more about other people, now though i do not allow it otherwise i would not be able to function and do what i do do as emotions would get in the way of it, so yh out for myself at the moment to be honest, but once im in a better position in life and my family are, financially,health wise,security wise then maybe that will change and ill try and bring other people up improve there lives and quality of (basically actually do the trickle down thing, hopefully if im not entirely selfish by that point and still have some sort of empathy let in me) but for the time being i only care for my family, the very few friends i do have and obvs myself, want and need to get my life sorted and improve my situation, health and money wise, so then i can focus properly on supporting my mum and family to improve theirs aswell im not really in a position at the moment where i can in any meaningful way, as she is far too depressed and low to even have a normal conversations with at the moment, shes distant and cannot gain joy in a lot out of life (specially people), money and security really is important as we are not taught the skills we actually need to live and provide for ourselves and even then its more money to even get started with those things. my mother needs financial security and i personally need my health situation to improve as it has real put a halt to any plans i did have and completely changed my perspective for the worst i think on life, money, people, jobs, purpose and everything really in general. thing is i need a purpose to life to be happy and i need my family happy and content to be happy so i can enjoy life with them and experiences it offers. cause the purpose of life really is just to survive/live and make it to the next day and i guess reproduce. life is pointless though to be honest with out a purpose made up or otherwise or without people family and friends to experience it with. everyone just wants to happy really, or at least have more up periods than down as you gotta be sad to know what happy is ha (happiness is just chemical reactions after all in your brain). when i get sick i always feel amazingly good and positive once i feel even remotely more myself and better, i feel so grateful for life again for a short while. anyway enough of my ramble felt good to write this out. You do realize that karl marx introduced the communist manifesto right? Marx also called religion the opiate of the masses and said that its abolition was the first requirement for the happiness of the people. Then his doctrine was used to murder tens of millions of Christians and desecrate their dead. Karl Marx was an atheist pig and his doctrine is steeped in the most vile and pernicious anti-theism to have plagued the world this century, if not of all time. When you stand before the throne of God, you’re going to have to account for the friends you kept, pastor. Sounds like Marx is suggesting that capitalism has become God for many.